Come to the Middlebury Center for Social Entrepreneurship’s symposium on Social Entrepreneurship and Social Justice. For more information on the MCSE and the full symposium schedule, visit http://mcse.middlebury.edu/connec/symposium/. This entry was posted in Student Activities on January 18, 2013 by Supriti Ghosh. All talks are held on Fridays, from 12:30pm to 1:30pm in Axinn 219. 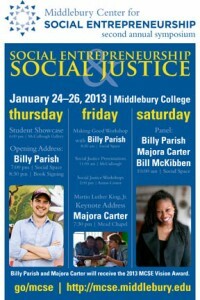 For more information on the Middlebury Center for Social Entrepreneurship, please visit http://mcse.middlebury.edu/. This entry was posted in Faculty and Staff, For Students, Middlebury Community Interest, Post for MiddNotes, Post for MiddPoints and tagged Middlebury Center for Social Entrepreneurship on November 8, 2012 by Supriti Ghosh. The fellowship will be open to Sophomore Febs, Sophomores, and Junior Febs wanting to engage more intensely with the field of social entrepreneurship. The fellows will become a cohort during their sophomore year and learn collaboratively from each other, be enrolled in a winter term class on social entrepreneurship, integrate theory and practice, and will receive $10,000 to engage in two summers of relevant experiences. Applications can be found at go/mcsefellows. For more information, please see the attached information or contact sghosh@middlebury.edu. This entry was posted in Faculty and Staff, For Students, Post for MiddNotes, Post for MiddPoints and tagged Fellowship, Funding, Middlebury Center for Social Entrepreneurship, Summer on October 26, 2012 by Supriti Ghosh.